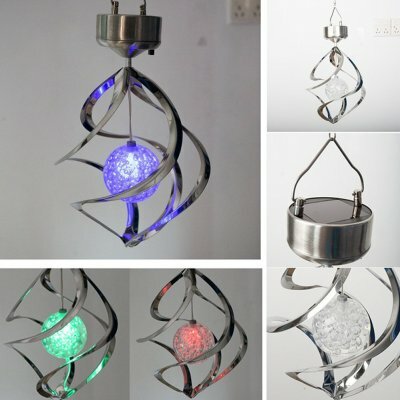 Successfully Added Wind Spinner LED Lamp Outdoor Hanging Wind Chime Light to your Shopping Cart. 1. Dusk to Dawn Sensor: Efficient solar panels charge the batteries by day, so the sensor can automatically turn on the LED at dusk. 2. Wind Chime Design: The spiral light will rotate when blowing in the wind. A Perfect Decor of Home. 3. Changeable 7 Colors Light: Light color include red, green, blue, yellow, purple etc. Work up to 8 hours when full charged. 4. Metal Construction: With a gorgeous appearance. Includes a metal hook and chain for easy hanging. 5. Wide Application: Waterproof design makes it suitable for Home; Outdoor Garden Lawn Lighting Decoration. Application: Home; Office; Outdoor Garden Lawn Balcony etc.